The cyclists who participated in the ‘Around the Pearl’ charity bicycle ride were received by family, friends and supporters at Park Street Mews recently, where they celebrated the successful completion of their journey around Sri Lanka. After having cycled 1,400 km to raise funds for 40,000 wheelchairs for children afflicted with Cerebral Palsy, the sun-burnt crew completed the final leg from Jetwing Blue, Negombo cheered on by family and friends. The ‘Around the Pearl’ team travelled around the entire island from Colombo to Weligama on the first day and thereafter to Kataragama, Arugam Bay, Passikudah, Nilaveli, Kovil Junction, Jaffna, Maruchchukkaddi and Negombo over a nine-day period, finally reaching Colombo on the 10th day. A recent addition to the event now in its third year was the formidable Chalai Challenge. The Chalai Challenge, saw 20 international riders and 50 local riders gather in Jaffna to take on a 94 km off-road race through an uncharted coastal route that tested their endurance. Cerebral palsy is the term for a group of non-progressive disorders of movement and posture caused by abnormalities or damage to the motor control centres of the brain. CP is a significant health concern in Sri Lanka and is highly stigmatised. Many people in Sri Lanka do not have access to adequate funds to care for children with CP and as a result cannot afford to buy wheelchairs for them. A simple wheelchair can provide a sufferer of CP with greater mobility and freedom, enabling them to enjoy a more fulfilling life. At the end of day 10, the ATP team will have raised enough funds to donate 40,000 wheelchairs to children with CP. For more updates on the ‘Around the Pearl’ journey and to pledge your support and donate, please log in to www.aroundthepearl.lk and https://www.facebook.com/AroundThePearl. Working to make a difference in the communities it serves, Mobil Lubricants Sri Lanka, as a part of its ongoing Corporate Social Responsibility (CSR) initiatives, has reached out to support ‘Around the Pearl 2016’ (APL) through a donation of 75 wheelchairs. These wheelchairs will be presented to children affected by cerebral palsy in Sri Lanka. 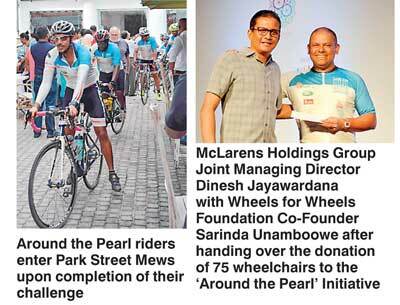 The ‘Around the Pearl’ programme took place for the third consecutive year in partnership with Cerebral Palsy Lanka Foundation to raise funds for the purchase of wheelchairs. APL is a 10-day bicycle ride around the coast of Sri Lanka which commenced on 7 April with 30 riders covering a distance of 1,400 km to support this mission. This annual challenge was started in 2014 by 12 cycling enthusiasts to help children affected by cerebral palsy and to date, funds have been raised for over 1,100 wheelchairs which is an initial step towards reaching their goal of 40,000 wheelchairs. McLarens Lubricants Ltd. Managing Director Hemantha Varnasooriya stated: “Community development is an integral part of our organisation. It demonstrates and sustains our commitment to conducting business in a socially and environmentally responsible manner which that stems from our vision, purpose and values of corporate citizenship. By extending our support to such initiatives, we strive to bring positive change to the communities we operate in, creating long-term social value.” ExxonMobil is the world’s largest publicly traded international oil and gas company which operates facilities and market products in most countries in the world, and explores oil and gas in six continents. McLarens Lubricants, Sole Distributor of Mobil Lubricants in Sri Lanka, is a part of McLarens Group, one of the country’s progressive conglomerates driving business across diverse sectors in areas such as shipping and marine services, logistics, lubricants and automotive distribution, trading, manufacturing, hotel services and property development.